Another PostgreSQL Diff Tool (also known as apgdiff) is free PostgreSQL diff tool that is useful for comparison/diffing of database schemas. The tool compares two database dump files and creates output with DDL statements that can be used to update old database schema to new one or to see in what exactly both databases differ. It is already being used by many developers all over the world. It will probably run even on other operating systems where Java is available. 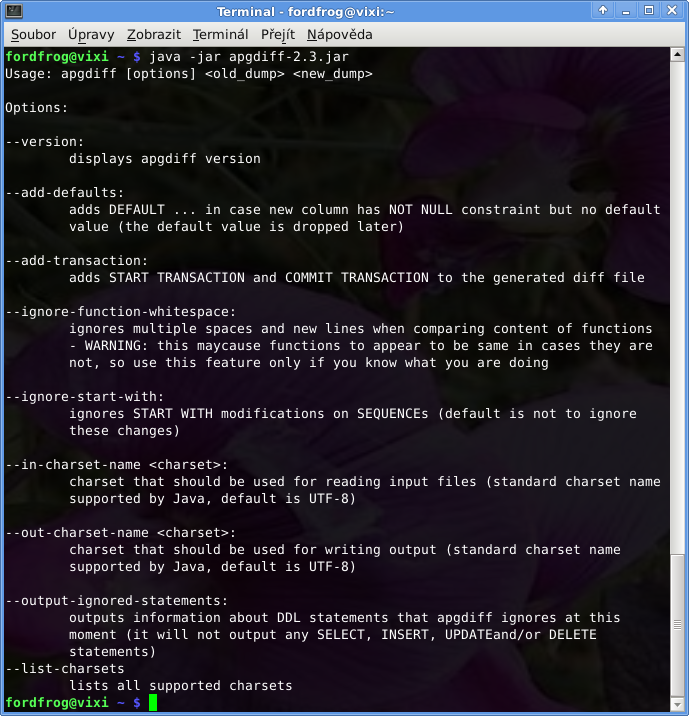 At this moment, apgdiff is only command line tool. That is great benefit for those of you that are used to work with command line applications, as you can easily use it from your batches, from your web applications etc. For those that are not used to work with command line applications, it may be little bit inconvenient, but it is not that bad as it might seem. Also, the good news is that next release of apgdiff will contain GUI (graphical user interface) so even those of you that do not like working with command line tools will be able to use apgdiff the way you are more convenient. To be informed about latest news and releases, register to Mailing List. You can also register to RSS feed to receive information about latest releases. 2012-09-21: Version 2.4 Is Out! This release brings several new features and bug fixes. See Changelog for more information. apgdiff sources and issue tracker have been moved to github to make it easier for apgdiff users to participate in apgdiff development. 2010-10-22: Version 2.3 Is Out! This release brings two new features and several bug fixes. See Changelog for more information. 2010-10-09: Version 2.2.2 Is Out! This is a bugfix release. It fixes many bugs. Also, Czech localization was added to this release. See Changelog for more information. 2010-10-03: Version 2.2.1 Is Out! This release fixes bug with dropping default values from VIEW columns even if they were not modified. Also, it adds to output of ignored statements even statements that are partially parsed. See Changelog for more information. You can find complete list of news at News page.